← Don’t Waste That Cake! This recipe was listed mid-year in the free Betty Crocker calendar I received by mail and was one of the few things that interested me, so I made it right away. It’s simple and very delicious and I will definitely be making it again! 1. Heat oven to 325°F. Heat taco shells in oven as directed on box. 2. Meanwhile, in medium microwavable bowl, place chicken. Sprinkle with taco seasoning mix; toss gently to coat. Microwave uncovered on High 2 to 3 minutes or until hot. Stir in 1/2 cup dressing. 3. Spoon warm chicken mixture into heated taco shells. Top with lettuce, tomato, cheese and onions. Drizzle with salsa and additional dressing. Instead of rotisserie chicken, use any diced cooked chicken. Offer additional taco toppings such as olives and sour cream. Posted in Main Dishes, Mexican and tagged chicken, ranch, tacos. Bookmark the permalink. I received that calendar too! :) You’re right, there weren’t a lot of recipes that I was interested in either, but these definitely caught my eye! I’ll have to make them now, your pic looks delicious! What a wonderful meal. Thanks for posting it! Delicious! Thank you… Mexican in Germany is awful, so this is exactly what I need. 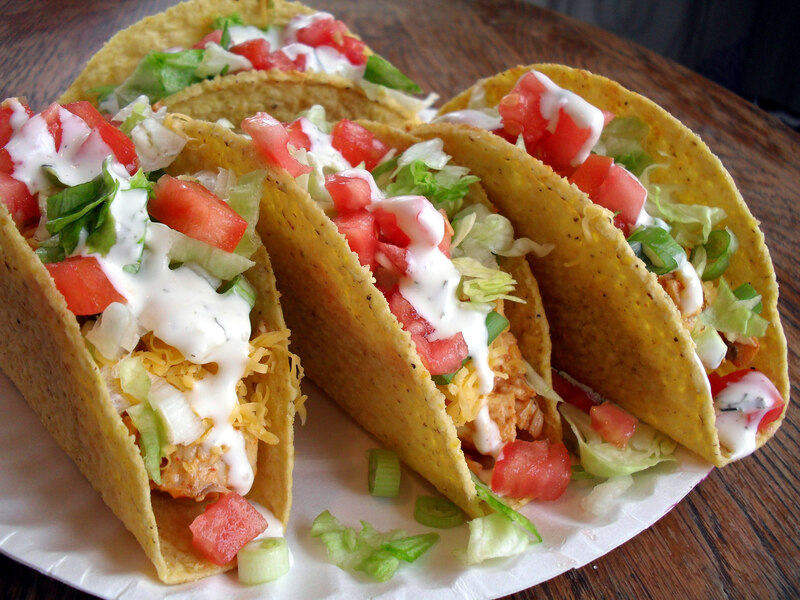 These tacos look great. Thanks for posting this recipe. Thanks for posting, i was wondering about these, and of course, your addition of homeade dressing makes it perfect!